Our weekend has been crazy busy! I helped to host a baby shower for my cousin, so I have to show you the baby quilt I made and the new dress to wear to the shower. I've been working on Penny Sampler blocks, too and love how it is coming together. Of course you can follow me on Instagram at courtiepie for more timely updates (and a lot of baby pictures!). 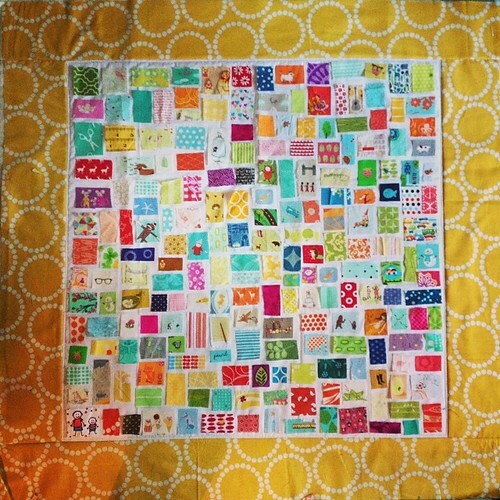 The above picture is the baby quilt I started for Sean. I've been wanting to make him a ticker tape quilt for a while because I think he will love touching all of the different fabrics and studying it. I decided I better get moving before he is moving! So all laid out, now I just have to sew down all those pieces. I'm thinking of doing it free motion quilting style to avoid turning all the corners. We'll see! On a side note, it seems like every time I replenish my stock of Pearl Bracelets in yellow, I immediately use it up! The kids are off of school today, so we're ready for Monday Funday (poor daddy has to work)! Before we get started, I wanted to pop in with a quick public service announcement. The Stash Bee is starting another round and looking for more members to fill out and create some more hives! I just signed up and I am so excited. I love that it uses your stash, so no packets of fabric to mail out when it is your month to be queen bee. That does mean you have to have a bit of modern fabric on hand to handle making the blocks for the other 11 months/members. You can read about it and sign up here! Last but not least, a big thank you to all the veterans for their service. Especially my Pappy, US Marine Corps in WWII. We appreciate and admire you.